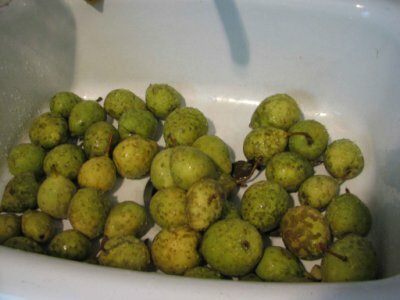 About two weeks ago I picked a bunch of wild pears off of a tree I had been watching since spring. I had two Wal-Mart sacks full of them! You are supposed to pick them while they are still hard and then let them ripen. 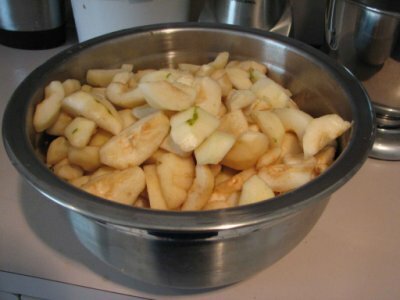 Well, they were ripe now, so I decided to put them up as pear butter (kinda like apple butter). Here are about half of them as I washed them in the sink. Then I cut them in quarters, peeled and de-seeded them. My hand was worn out after peeling so many – it took almost two hours! This is the biggest bowl I have, but the picture hardly does it justice. They were very good and I kept snacking as I worked I froze a ziplock bag of them, made two loaves of pear bread and cooked the rest in a big pot until they were soft. 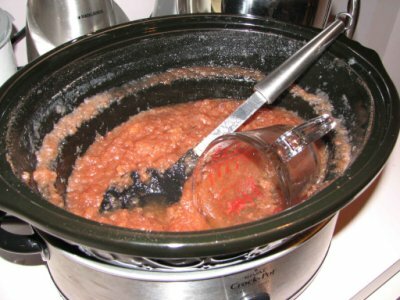 Then I mashed them and put the in the crock-pot over night with a few spices and some sugar. Here is the finished product, or at least half of it, I’d already dished half of it out into a applesauce jar before I remembered to take a picture. It was a nice sloppy mess . It tastes pretty good though – we had it on our pancakes this morning. So there you go, homemaking 101!